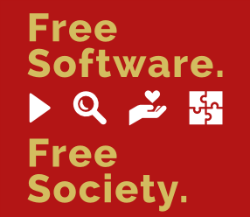 In a scathing critique, the Free Software Foundation is urging the U.S. Government to drop the DMCA's anti-circumvention provisions which protect DRM. The foundation argues that DRM is a violation of users' rights, which under the guise of copyright protection is used to harm, control and spy on people. Late last year the U.S. Copyright office launched a series of public consultations to review critical aspects of the DMCA law. This includes a review of the anti-circumvention provisions (section 1201), which prevent the public from tinkering with DRM protected content and devices. A lot has been said on the topic over the past months. Most copyright industry groups are in favor of keeping tight restrictions, while digital rights groups argue the opposite. Most opponents point out that DRM does more harm than good and some see it as plain evil. The Free Software Foundation (FSF), which is a rightsholder of a lot of GNU/Linux software, clearly falls into the latter category. FSF sees no future for DRM and urges the Copyright Office to repeal the DMCA’s anti-circumvention provisions. “Technological protection measures and Digital Restrictions Management (DRM) play no legitimate role in protecting copyrighted works. Instead, they are a means of controlling users and creating ‘lock in’,” FSF’s Donald Robertson writes. According to FSF, copyright is just an excuse, the true purpose is to lock down and control users. Through DRM, companies try to keep users on board, as it often restricts them from easily switching to other platforms or digital stores. Even if copyright was the main concern, DRM would be an overbroad tool to achieve the goal, the foundation notes. FSF highlights that DRM is not just used to control people but also to spy on them, by sending all kinds of personal data to technology providers. This is done to generate extra income at the expense of users’ rights, they claim. “DRM enables companies to spy on their users, and use that data for profit,” Robertson writes. “DRM is frequently used to spy on users by requiring that they maintain a connection to the Internet so that the program can send information back to the DRM provider about the user’s actions,” he adds. Under current law, there are some exemptions which allow people to circumvent DRM, but FSF says this is by no means sufficient. Abandoning the anti-circumvention provisions entirely is the only right thing to do, they say. The foundation adds that there are plenty of alternatives to address copyright concerns. FSF itself holds the rights to a lot of GNU/Linux software, for example, and says it has resolved many copyright violations without the need for invasive DRM. “All DRM is a violation of the rights of users. The exemptions process as outlined by section 1201 is completely broken beyond repair. No amount of exemptions, except a permanent exemption for all uses, can rectify the situation,” FSF writes. If the Government is not ready to for a full repeal of the anti-circumvention provisions, it should at minimum broaden the existing permanent exemptions to more uses, FSF argues. The Copyright Office now faces the unenviable task of reconciling the positions of all parties that submitted comments. Given the wide range of positions, it’s impossible to reach a compromise that will please everyone involved. The full comments of the Free Software Foundation have been published by the Copyright Office in pdf format. I like when companies like Disney include a "Free" digital copy with their DVDs.They try to trick people into thinking that the only way to get the movie onto a computer is by including a "bonus" disc that requires registering on their website to watch it.Then it can only be watched on the machine that registered it and they act like you are getting something great for free.If they had brains they would just let you do the same thing with the regular disc.The lengths they go to in an effort to make people ignorant to reality is amazing.It's enough to drive a person to put their movies online out of spite.